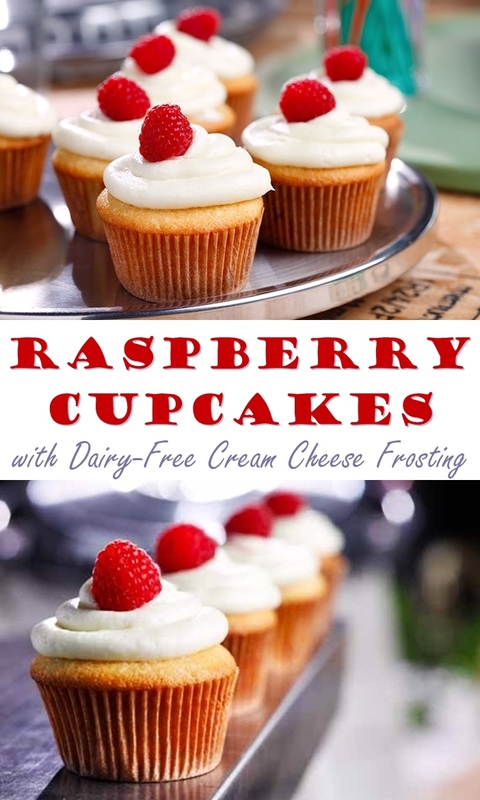 This dairy-free recipe for raspberry cupcakes is a year round classic for birthday parties and celebrations. It can be customized to fit any season, and right now, fresh berries and patriotic barbecues are the theme. For 4th of July gatherings, use a combination of blueberries and raspberries for that traditional red, white, and blue dessert effect. 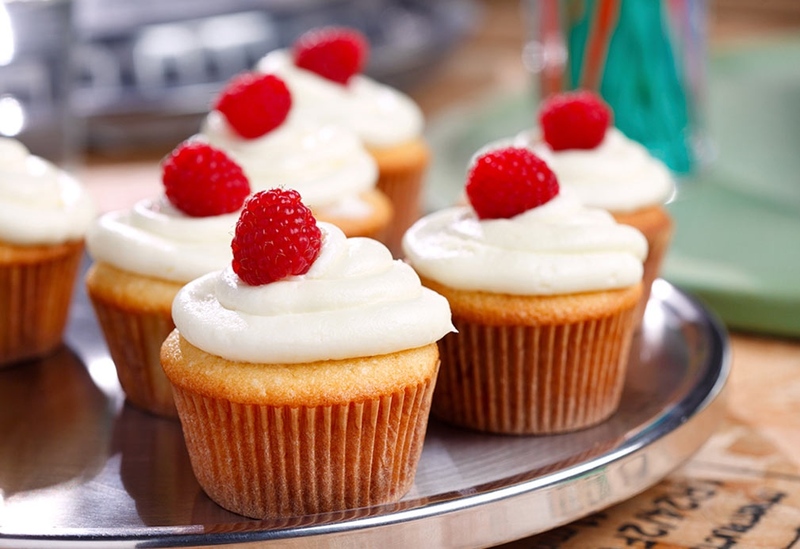 This recipe for raspberry cupcakes was created by Frankie Francollo (slightly adapted). It along with the photos were shared with us from the Street Eats Recipe Collection. 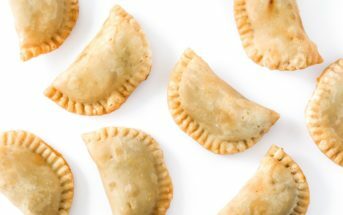 By ingredients, this recipe is dairy-free / non-dairy, nut-free, peanut-free, optionally soy-free, and vegetarian. 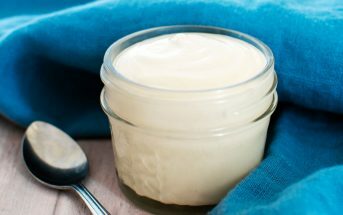 To keep the recipe soy-free, use a cream cheese alternative such as Daiya or prepare the cashew cream cheese alternative recipe in Go Dairy Free. A double batch will do ya, making a full 16 ounces of creamy and slightly tangy goodness for the frosting. 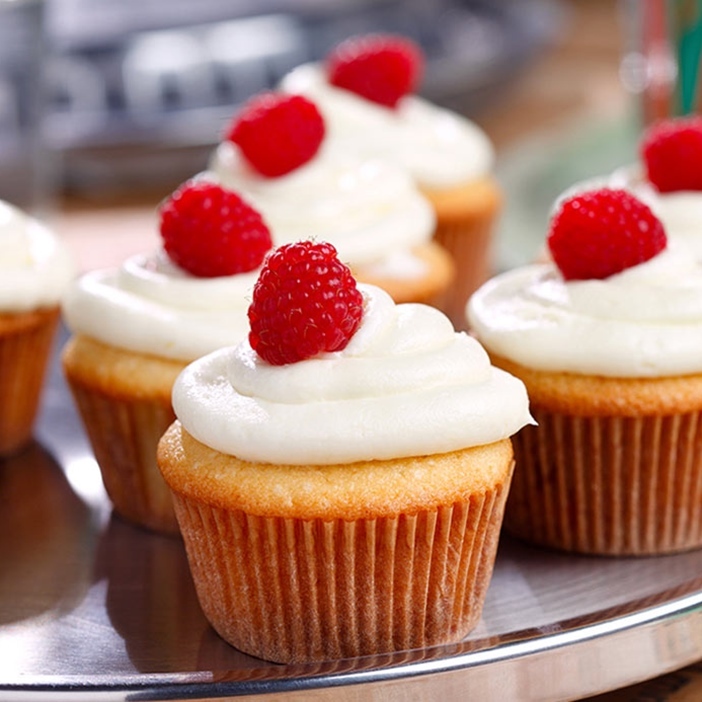 For gluten-free raspberry cupcakes, you should be able to substitute your favorite gluten-free flour, as long as you keep those eggs! For egg-free and vegan raspberry cupcakes, you might be able to substitute egg replacers such as Ener-G for the eggs, but it hasn’t been tested here as of yet. Preheat your oven to 350°F, and line 24 muffin tins with cupcake liners. In a medium bowl, blend the sugar and eggs until thick, about 1 minute. Add the milk, canola oil, and vanilla, and mix until smooth. While mixing, slowly add the flour mixture to the wet ingredients until fully combined, scraping sides of bowl with spatula to get out all lumps. Remove the bowl from the mixter, and gently fold in 1 cup of the berries. Divide the batter between your muffin tins; they will be about two-thirds full. Bake the cupcakes for 20 minutes or until they spring back to the touch. Remove the cupcakes from the oven and let them cool completely while you prepare the frosting. For the frosting, place the cream cheese alternative in a medium bowl and mix it until smooth. Slowly add the sifted powdered sugar and vanilla until fully combined. Spoon the frosting into a pastry bag with medium round tip and pipe on top of cooled cupcakes. Top the cupcakes with the remaining 1 cup of berries. I was wondering if you knew of any soy-free, dairy-free frosting that would work well with this recipe or other recipes that typically go with cream cheese frosting (like carrot cake).